Complete Microsoft Outlook synchronization. Your Outlook account on several computers will be in sync. Including all folders and such changes as deleted items, read/unread status, flags, categories, etc. Microsoft Outlook web access. Your Outlook can be accessed via Outlook Web App using any web browser. It has almost the same set of features as Microsoft Outlook on your PC, including rules for emails, reminders, alerts, etc. User interface and experience is similar to Microsoft Outlook. Smartphones and tablets support. Sync changes between all of your devices and work with Outlook and the rest of Office on the phone the same way you do on PC. Access and share files that you have created on your PC or any other device. Share using native Microsoft Outlook UI. Share calendar, tasks’ or contacts’ lists with other people in your team using the native Outlook user interface. Office 365 eliminates the need to buy additional third party sharing tools. Access your old ISP email accounts and messages. Your old messages and accounts can be accessed and used with Office 365 and via Microsoft Outlook. Have several email accounts under one “roof” without paying additional fees and annoying Ads. 1TB storage speaks for itself. There will be enough space to move and store your old data. Better file sharing. Access, edit and share Microsoft Office files and documents, stored in the cloud. Work with your co-workers on the same documents online or offline, they will all be in sync. You don’t need to upload, download files or change the format. Instant messaging and conferencing with Lync. It gives you many advanced features that other IM tools do not have: audio/video conferences with multiple users, screen sharing, whiteboard, recording, PowerPoint slides integration, conversation history on Outlook or web, direct calls from Outlook, calls to phone, contact users outside Office 365 via web. Phone, email and live chat support 24/7 provided by Microsoft. 4Team products for more advanced and powerful Microsoft Outlook features with a 50% discount. Complete Microsoft Outlook synchronization. You can set up the same account on several devices and they all will be in sync. Not just emails, but calendars, contacts, tasks, reminders, flags, categories and changes like deletions, read/unread status, etc. Office 365 advantages over Google Sync for Outlook. Free email accounts don’t have Google Sync. For those who pay, Google Sync synchronizes only data, but not the changes. And only the default folder is synchronized. Office 365 syncs changes such as deletions, read/unread status, categories, rules, reminders, etc. And the whole folders’ structure is synchronized by Office 365. Office 365 advantages over MSN (Hotmail) Connector for Outlook. Office 365 not only synchronizes Outlook of a desktop and on the web, but also gives you the same experience, because the UI is almost the same. And you avoid having an add-in, which slows down your work. All emails in one place without Ads. Set up your Gmail, Hotmail or other email accounts in Office 365. Keep your old credentials and use all the great features offered by Office 365. Have several email accounts under one “roof” without paying additional fees and annoying Ads. Mobile and tablet support. Sync changes between all of your devices and work with Outlook and the rest of Office on the phone the same way you do on PC. Access files that you have created on your PC or any other device. No ads. Enjoy ad-free environment using Microsoft Outlook email and Office via web browser. Share using native Outlook UI. Share calendar, tasks’ or contacts’ lists with other people in your team using the native Outlook user interface. 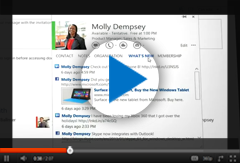 Office 365 eliminates the need to buy additional third party sharing tools. Better file sharing. Access, edit and share Microsoft Office files and documents, stored in the cloud. Work with your co-workers on the same documents online. Messaging and conferencing with Lync gives you many advanced features that other IM tools do not have: screen sharing, whiteboard, recording, history of conversations available at Outlook Web App and on premises, calling directly from Outlook, video and phone conferencing. Advanced support from 4Team professionals.. We can take care of deployment, migration and other advanced tasks like PST file repair, merge, split, etc. Synchronization of all Outlook folders. You can set up the same account on several devices and they all will be in sync. Not just emails, but other folders such as calendar, contacts, tasks, and most of the changes set in Outlook: tasks, rules, flags, categories, reminders, etc. Unlocked Outlook advanced features. You can take advantage of all the great Outlook features on your desktop and the web. An integrated free/busy time feature for better scheduling, sharing any folders with others and many other. Smartphones and tablets support. Sync changes between all your devices and work with Outlook and the rest of Office on the phone the same way you do on PC. Access files that you have created on your PC or any other device. Share using native Microsoft Outlook UI. Share calendar, tasks’ or contacts’ lists with other people in your team using the native Outlook interface. Office 365 eliminates the need to buy additional third- party sharing tools. 25 GB storage speaks for itself. There will be enough space to move and store your old data. Messaging and conferencing with Lync gives you many advanced features that other IM tools do not have: screen sharing, whiteboard, recording, PowerPoint slides integration, history of conversations available at Outlook Web App and on-premises, direct calls from Outlook, phone conferencing.